In this unit, students learn to use sparkly words to describe an object in detail. 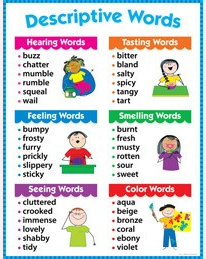 Descriptive writings often contain multiple adjectives that enhance the quality of writing. This writing unit in particular focuses on using 5 senses to explore different ways of describing an object.